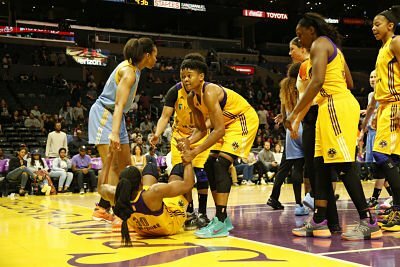 Sky center Imani Boyette and Sparks guard Alana Beard help Nneka Ogwumike to her feet after a foul. Photo by Maria Noble, WomensHoopsWorld. 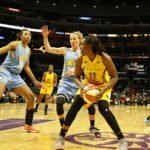 Chelsea Gray debates her options against Imani Boyette and Courtney Vandersloot. Photo by Maria Noble, WomensHoopsWorld. 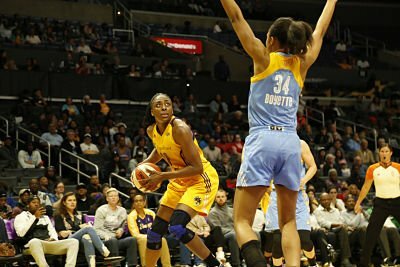 Nneka Ogwumike lines up her shot. Photo by Maria Noble, WomensHoopsWorld. 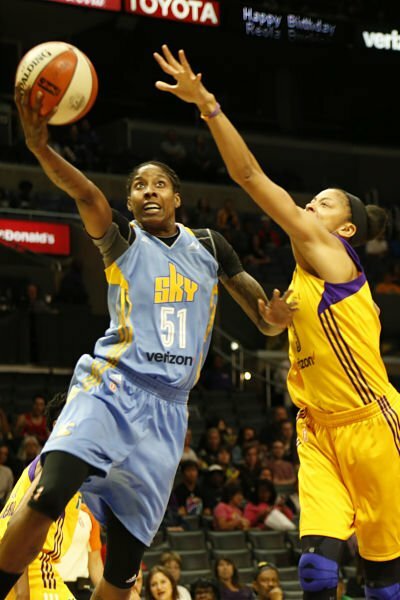 Odyssey Sims tries to push past the Sky defense. Photo by Maria Noble, WomensHoopsWorld. 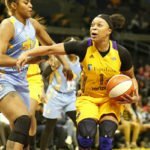 Cappie Pondexter forces up a shot. Photo by Maria Noble, WomensHoopsWorld. 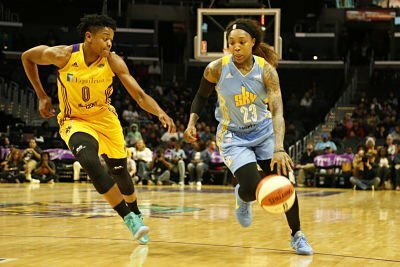 Cappie Pondexter pushes the ball up court as Alana Beard defends. Photo by Maria Noble, WomensHoopsWorld. Allie Quigley is defended by Essence Carson. Photo by Maria Noble, WomensHoopsWorld. 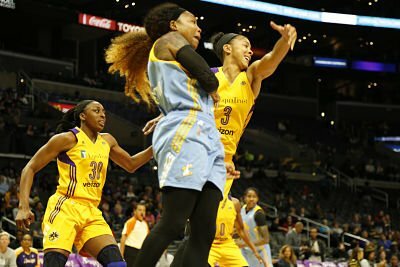 Jessica Breland tries to score over Candace Parker. Photo by Maria Noble, WomensHoopsWorld. 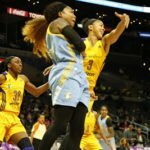 Candace Parker defends Cappie Pondexter. Photo by Maria Noble, WomensHoopsWorld. 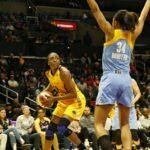 Los Angeles – Following a 22-point performance against the New York Liberty last week, many wondered what Sparks forward Nneka Ogwumike would do for an encore performance once her team returned home. 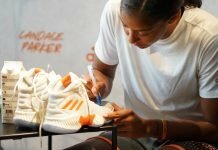 The league’s reigning MVP didn’t disappoint, notching her first double-double of the season in leading Los Angeles past the Sky Tuesday, 79-70. 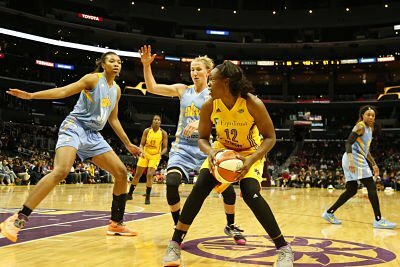 Ogwumike had 20 points and 11 rebounds, Alana Beard added 18 and Candace Parker scored 12 in the Sparks’ second straight win. 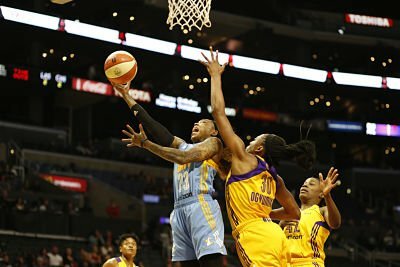 Los Angeles jumped out to an early five-point lead that they maintained throughout the opening quarter. 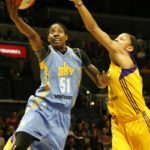 Chicago then closed the gap early in the second quarter, narrowing the Sparks’ lead to two off a Courtney Vandersloot running layup. But the hosts ended the run there, closing the half on a modest 11-7 run while stretching the lead back to six points. 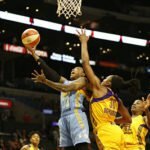 The two-point deficit marked the closest the Sky would get until midway through the third quarter. 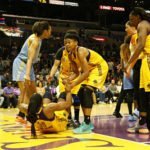 The Sparks opened the period shooting only 25 percent from the field, a mark that allowed the visitors to tie the game at 49 at the four-minute mark. 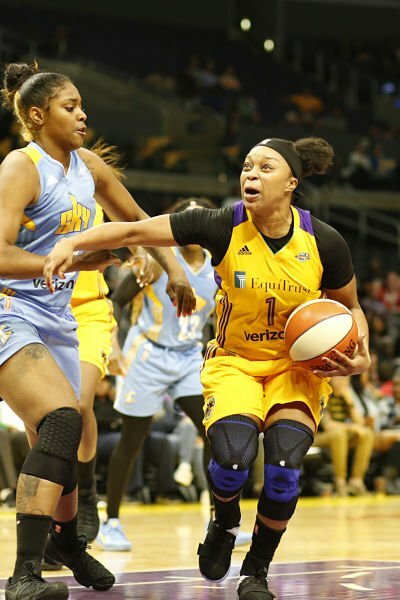 Los Angeles opened the fourth quarter with a run, and stretched their lead back to nine after back-to-back buckets from Beard and Chelsea Gray with 2:13 to go. 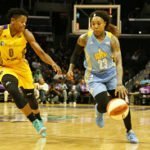 The Sky, meanwhile fell to 1-7 on the season with the loss. 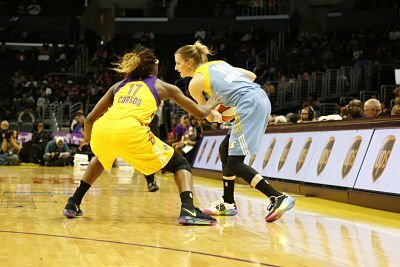 Their effort was led by Courtney Vandersloot and Allie Quigley who tallied 13 and 12 points, respectively. Stefanie Dolson also finished in double figures for Chicago, adding in 10 points of her own. 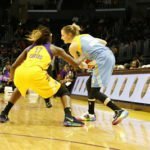 Dolson said there were positives in the loss.